To select the best hammer drill for concrete, you need to be careful with what you look for, or else you’ll end up buying the wrong tool. I have looked through the hammer drill market, and I have realized that there are so many great models coming out. The older models are facing stiff competition from their newly introduced counterparts. You can still get good tools from the past, though. One of the most notable differences between the tools from the two generations is that the new ones have lots of innovative features that have clearly revolutionized the hammer drill industry a great deal. The older models are however still ahead concerning strength and performance to a certain extent. This hammer drill review will take you through the top rated hammer drills for concrete to help you make the right choice concerning these power tools. Selecting a good hammer drill for the money is not a simple task. These reviews will help you compare the features of some top models so you are sure of getting a perfect product. There are a lot of this hammer drill that many users have praised it for, especially because not many hammer drills can match its performance and usability. With a 7.8 amp motor, expect a high performing hammer drill for concrete that also has an overload protection feature, which maximizes the safety of both the machine and the user. The hammer drill features a 360 Degrees side handle with depth rod that offers greater control, maximum versatility and a greatly enhanced accuracy. This makes using it a breeze and quite relish-able. Operating at a maximum speed of 2700 RPM, this hammer drill has a powerful performance that you need to get any drilling job done no matter the type of material involved. The reverse switch is strategically placed to enhance its convenience so that your drilling works are made easier, and the overall control is greatly enhanced for a much better result. This drill provides 0-2,700 RPM and 0-46,000 BPM. Hammer drill and regular drill mode. Very light weight hammer drill and only 4.3 lbs. Good hammer drill for masonry applications. No case. You have to buy a bag or case latter. This is the kind of hammer drill that will accomplish any drilling work. It has all the features that you’d look for in a contemporary drilling tool. The weight of this power tool is ingeniously calculated in such a way that it provides maximum control to the user. The result us a tool that feels comfortable in the hands. I’ve used this hammer drill, and I can assure you that not many tools of its kind that can beat it in this drilling game. Its 10.0 Amp motor is one of the reasons for the powerful performance. This hammer drill has a elegant design. It looks as powerful as it performs. Everything is put into place in such a way that using it is so easy and convenient. This dual node hammer drill is ideal for various materials including wood, steel, and for masonry. This makes in suitable for users whose field of operation borders around a variety of materials. Most powerful hammer drill with 10.0 AMP motor. Comes with 360 degree side handle. Has strong steel depth rod. it has no locking trigger but I think this is a minor issue. This unique product comes with extra durability for professional drilling. Moreover,it is specially designed for the big application. Thus, this device can be used for different drilling purpose with different materials. The key character of this device is a high capacity motor with more power and durability. It has an additional feature of switching between the hammer and drilling modes. This drilling machine is versatile and applicable for brick, block, wood, and metals. In fact, the user can change the modes with the type of equipment and drill without facing any problems. Further, it includes a side handle that helps to get good control of the device due to severe applications. It has maximum strength for heavy usage. It has cast metal gear housing that provides dissipation of heat and increased speed. Moreover, it comes with dual transmission facilities that provide the maximum durability. The dual transmission provides maximum speed and maximum torque in two different settings. This portable drill machine has the unique design with the streamlined mounted body. It helps the user to hold correctly. Extra side handles and depth rod will make the user more comfortable to hold. You can even drill with this machine without any boredom. It can be an excellent companion for drilling on extended time. It has two finger locking trigger for long time use. Metal chuck provides enough pressure to hold the bits up. Versatile drill machine can drill on different material. Capable of switching in two drilling modes. 7 Amp motor provides higher performance. 1/2 inch metal keyed chuck. Those who are looking for a powerful and skilled drill at a low price Skil 6445-02 1/2-Inch Hammer Drill would be a great choice for them. If you choose your drill for lite work purpose this will be the best. So, in your affordable price, there wouldn’t be any drill better than this. The powerful 7.0 amp potent motor including hammer function help better & faster drilling. Additionally, a side handle assures swift control and accurate drilling. You may get few better drills than it, but those are much more expensive according to this high efficient motor. This skil hammer drill is the best option for DIY jobs around the house. It has ½ inch chuck with key, is specially designed for cutting materials and wood drilling. So, you can also use this safely in your everyday works. As it is a corded drill, no battery needed. There is a variable speed trigger which lets you control the drilling speed. 2 fingered trigger with a unique lock-on which increases the control of the drill in forward/reverse speed. For the conventional drill, the Bosch 1191VSRK will be a good selection. Even you can use this drill as a hammer drill. It provides you the facilities of selecting the drill mode. You can change the mode according to your needs. A 360-degree handle comes as an additional facility of rotation. The Bosch has many great features drills. But it’s a simple tool for those who has a limited budget. It has 7 Amp motor with high torque and power. Also, the motor is a reversed motor, provides enough efficiency for hundred of drills. It can run in with the speed of 4000 rpm at no load condition. Individual switch will help the user for reversing the rotating direction. The standard compact hammer drill has an additional handle that rotates about 360 degrees. So you can see that it’s an amazing feature. When the user feels tired of holding the handle for a long time, he can turn it with suitable direction. This drill can be applied metals and woods in standard mode. For drilling the bricks, wall, and concrete, the user needs to set the hammer-drilling mode on. The drill is a single speed drill machine. Unlike other updated hammer drill the device doesn’t contain dual gearbox. So, it’s very simple in design and useful for small diameters. Besides, it’s mostly suitable for the metals and woods. Again, it includes a trigger switch for varying the speed. It has powerful 7 Amp motor. Very lightweight and easy to carry. Includes a handle for 360-degree rotation. It contains two modes of drilling. Depth gauge and plastic carrying case are also provided. A ½ inch key chuck generally and ⅝ inches for concrete drilling. Very comfortable device for home use. Doesn’t have any trigger lock. The DEWALT DWE5010 1/2-inch hammer drill is useful for medium works and different materials. It’s an excellent device with reducing user fatigue. Among many other hammer drills, it is less expensive. So, people mostly choose this product for its low price. Some drills are heavy to hold for the extended time. In this case, the users will find this machine in only 4.3 lbs weight. It is comfortable to hold, even though you get tired of it. Moreover, the dual operation mode of drilling and hammering is applicable for different materials. The drill is very nice to handle and service. The device has a trigger with a lock. The trigger is made of rubber and very convenient for continuous drilling. For tighter spaces, this is the perfect machine for drilling. The locking system of the trigger will help the users for extended drilling. It has two finger trigger that is very useful for the repetitive application. The training is versatile and can work on different materials. As the device comes with two modes, the user can change the mode from drilling to hammer drill. This drill is very compact in design and easy to hold. It includes a side handle and depth rod to have more control on drilling. It also provides different speed to the customer for precise drilling. 7 Amp motor gives overload protection. Versatile drill for different materials. Includes key chuck with holder. A rotating side handles for comfortable work. Compact design with higher accuracy. Maximum ½ inch for concrete and steel. Rubber trigger provides additional comfort. Not preferable for construction work. The BOSTITCH BTE140K is very useful in multiple home repair applications. It will provide you with the most contemporary method to drive screws and nails into wood and other types of materials. It is powered by a 7 amp motor that provides it with plenty of power so that you can use it for tough applications that some of its competitions can’t handle. The BOSTITCH BTE140K features a drill and hammer drill modes, together which provide optimal performance in a large variety of materials. Owning this power tool saves you from buying tools separately. This is a classically designed handle with over mold. This handle is created in such a way that it reduces user fatigue besides enhancing the comfort of its users at the same time. It is a durable piece of technology whose durability is even enhanced through the inclusion of a metal gear housing. This housing helps disintegrate heat away from the internal components. Metal gear technology to reduce internal heat. Comes with big nice kit box. No LED light. You have light in a shadow place. Makita HP2050 drill is suitable for multiple actions. For limited budgets, it is an excellent product. The design is unique and comfortable to operate .Powerful motor supplies proper torque for sensitive applications. Each feature of this hammer drill will provide enough facilities for drilling in demanding objects. It complies with a 360-degree swivel side handle for better holding. Its capacity is ideal for home application and medium range works. The user will find the drill as a complete machine for medium works. It has a 6.6 Amp motor with great power support. Though motor Amp is not as high as previous seven, it’s enough for fulfilling your demands. Also, the drill has a dual mode selector. The mode selector will be used for selecting the rotating and hammering modes. It includes a variable speed dial and two-speed variable. The drill can work in maximum 2900 RPM. In addition, it has good torque clutch to prevent unusual incidents. The drill is unique in design. Unlike the drills, it doesn’t have the same boring design. It has a rubber grip for better comfort in holding. The manufacturer designed this machine for reduced noise. Also, it has the lower vibration which makes the task easier for the users. It would be the right device as it has a recessed lock and on switch for an extended time and continuous application. The hammer drill has a large trigger switch for the user’s convenience. It includes a side handle with 360 degree rotating features. Additionally, the ball- bearing ensures the longer durability of the tools. The keyed chuck holds the bit tighter. 6 Amp powerful motor with proper torque. Variable speed dial for controlling speeds. Includes a larger trigger switch. 360 degree rotating side handle provides better facilities. Can be used for multiple actions with two different modes. It offers reducing noise and vibration. Dual variable speed ranges 0-1,200 and 0-2,900 RPM. 3/4 inches can be drilled in concrete. Chuck capacity is 1/2 inch for steel. If you are looking for a cheaper hammer drill for your home services only, the PORTER-CABLE PCE141 will be the best choice. It is the 9th product from the best hammer drill for concrete list.This one is a single speed hammer drill and provides good support for the tough job. Every feature included in this device is just perfect for hardest jobs. So you can drill with it very smoothly without facing much vibration. It is cheaper than other nine drills of this list. If you have a small budget for this purchase, you can have this without any hesitation. The drill comes with a very reasonable price for those who doesn’t have much to spend for this. Furthermore, the 7 Amp motor provides greater performances and ensures high durability. The drill can be applied to different materials like metals, woods, brick, blocks, and concrete. In fact, it has versatile applications. Even the user can use this product for masonry materials. User can switch the modes between drilling and hammering for his convenience and better performance. The machine offers a pistol grip side handle for more comfort while holding. It includes streamlines over the body for tighter holding. The drill has less user fatigue due to operation. This device provides good control and better balance for the users. The machine includes a cast metal gear that helps to pass internal heat and provides enough ventilation. Hence, the internal components become more durable and provide better service. For the continuous application, this could be the perfect drill. It offers a chuck that comes with a key and a holder with it. The holder will help to hold the bit tightly so that it doesn’t fall loose. It includes two finger locking triggers which are perfect for continuous work and extended use. It has 7 Amp powerful motor. Offers maximum durability for toughest jobs. Can drill on metals, woods, and concrete. Pistol grip handle provides more facilities for controlling. Increased depth accuracy of holes. Two finger trigger offers extended use. Extra side handle provides excellent control for severe duty. 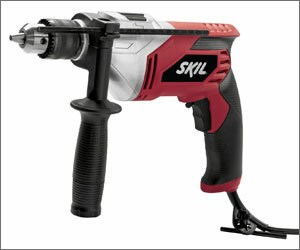 This hammer drill portrays how much SKIL is ahead of its competitors in the power tool production. Everything about this hammer drill will impress anyone with serious tasks to accomplish. The SKIL 6445-04 is fit with a side-assist handle that largely aides better control and a more accurate drilling. Thanks to this handle design, you will even enjoy using this tool even when the task becomes tiresome. It boasts a 2-finger trigger with a lock-on that enhances its functionality a great deal. This is one of the many features that contribute to the increased control of the power tool. The SKIL 6445-04 has 1/2 inches keyed chuck that allow it to access large diameter bits that are designed for cutting and woodworking. This is one convenient feature. It features a variable speed trigger in which you can select the most appropriate speed that you’d want to drill with. The speed choice varies with materials involved or the task at hand. 7.0 APM very powerful motor. 51,000 BPM suitable for any tough applications. Perfect for concrete, woodworking and cutting. Comes with a strong side handle. It has two drill settings: 1) Hammer drill and 2) Regular drill. The best hammer drill for concrete is the one that will serve you in the best possible way concerning drilling and hammering. Drills are pieces of equipment that are very sensitive to weight. The user will immediately notice the effects of a weight imbalance in the drill. If the drill is too heavy, the effects are almost obvious. The handling will be tough and a real chore. This will interfere negatively with the work output of the drill, and this is not the outcome one wants. The user ought to look at the weight specification of the drill before buying it and decide what is appropriate. The design of the handle will determine the level of comfort for using the drill. Hammer drills with good handling are comfortable in the user’s hands and minimize challenges while handled. The convenience of the handle is determined by the engineers. Users should, therefore, choose drills that feel comfortable in the hands while in use because it will affect the performance. The motor power varies with different power drill types. The higher the motor power, the higher the performance. The power of the drill should guide you into choosing the best drill suitable for the tasks at hand. There are materials that don’t need high power. If you want to purchase a new hammer drill, be careful not to pick one with unnecessary high power or too low power for your tasks. The motor power will greatly determine the performance of the drill on different materials. The cord should not be too short, neither should it be too long. When selecting the best hammer drill for concrete, make sure the length of the cord is long enough to give you the chance to reach even longer distances. If it is too short, it might be convenient you, especially when you want to drill a material that is a little bit far from the power source. To avoid such inconveniences, it is better if you purchase drill with a longer cord. This is the end our reviews. With so many models of best hammer drill for concrete in the market today, it’s easy to end up buying the wrong tool. That is why this reviews should guide you into making the right choice. With any of the hammer drills in this review, you can achieve the best in your drilling work. Each of them is ingeniously engineered and designed with perfection in mind. The best part is that they don’t cost much like you’d expect them to. They are reasonably priced, and you should take advantage of this.